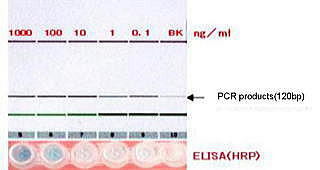 The “imTag　PCR” applies the technology of “Immuno-PCR” to detect an antigen of an existing infinitesimal antigen in a sample. This “Immuno-PCR” is the technology that Sano　et al. reported in 1992. It is a detection technology that has both peculiarity of antigen-antibody reaction and the superior detection sensitivity that PCR method has. In this way, it was superior technology. But there were some problems in detection sensitivity and quantification. We have resolved these problems by performing improvement of solid-phase materials and blocking agent, nucleic acid tag connected in an secondary antibody and sell it as a kit. compared with the conventional way(ELISA).